If the Brazilians can be said to have a natural talent at football and New Zealanders the same at rugby, then Mancunians are natural born purveyors of indie, with a head-start in swagger that puts them ahead of the rest. And chief among that race is surely Johnny Marr. For many guitarists in a band, losing arguably the most iconic frontman of the 1980s would cut you adrift in obscurity. But after the Smiths and Morrissey parted ways, Marr has gone striding on, burnishing his talent with each album. Last night a startling array of ages and fashions - fortysomething mods, a handful of indie teens, some grey-haired couples apparently dressed for the theatre - came to Roadmender in Northampton to pay homage. Dressed in a pin badge-studded denim jacket fastened up to the throat, Marr struck heroic poses and effortlessly blasted out compound riffs at will, bathing in the devotion. Inevitably, the biggest crowd reaction came from The Smiths numbers sprinkled through the set list. The echoing strains of Panic, two songs in, sent the packed venue into delirium with ‘hang the DJ’ shouted back with surprising force at the bouncing Marr, who looked like he loved it. By Bigmouth Strikes Again, he had shed the denim and, sporting a patterned shirt, led the room in a raucous singalong with heart-stopping guitar flowing instinctively out of his fingers. And How Soon is Now filled Roadmender with not only those nostalgically eerie chords, but about 1,000 souls recalling the original angst as they roared “I am human and I want to be loved”. The point is that the crowd enjoyed the process and delighted in it as much as - albeit slightly differently from - if Morrissey had been there instead, glorious though his desperation can be. Morrisey is the agony of The Smiths but Marr is the ecstasy. 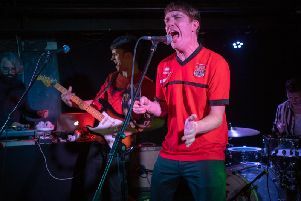 As a result Roadmender had an uplifting vibe that dispensed with the dread of truly authentic Smiths, but was perfect for a gig to celebrate the exquisite artistry of the collaboration without the overtones of gloom. Not that it was all about The Smiths. Getting Away With It, written when he was part of the alt dance supergroup Electronic, exhibited Marr’s latent diversity since the big split. Hundred of fingers jabbed each syllable of ‘all my life’ at the stage and Marr, singing ‘Uh-uh-uh-uh’, wagged a digit camply, enhancing rather than diminishing his majesty. And his 2013 thumping single Generate Generate saw Marr in ultimate indie icon mode, nodding his head as he went for a minstrel’s wander then, head turned to the side and eyes closed, lapping up the adoration. The end came with a four-song encore that finished with another Smiths number, There is a Light. Never has death been wished upon ourselves as joyously as when Marr is the conductor. At times he left the crowd to it who were more than happy to sing for him football-crowd style, performing for him in earnest tribute. Morrissey makes you think, but only Marr, even in desolation, makes you grin. Shelling out for a gig on an October night, I know which I wanted, and Marr provided it. A natural born indie idol who has lost none of his lustre.